Keep putting good energy out there. Do somebody a favor today. Shovel your neighbor’s walk when you’re out doing yours. Karma is real – cause and effect. The more good you put in the world, the more good there will be in the world. Every person in the crowd is important. Make sure you’re taking time to connect with every person out there. It’s tempting to just focus on the fun people who are giving the energy back to you, but take the time to branch out from that core. Even a glance and a smile can affect the energy in the room. Don’t worry – that core group will still be there for you if you need an energy refill. When playing an all-request show, you absolutely must stay up-to-date with the current trends in pop music. I try to keep at least three or four current top ten songs ready to go. Right now that means “Love Yourself” and “Sorry” by Justin Bieber, “Stressed Out” by twenty one pilots, and “Hello” by Adele. Mind you, I’m not memorizing these tunes – most of them won’t make it a month in the zeitgeist – but I certainly get familiar enough with the tune that I can pull up some lyrics and perform it pretty well. 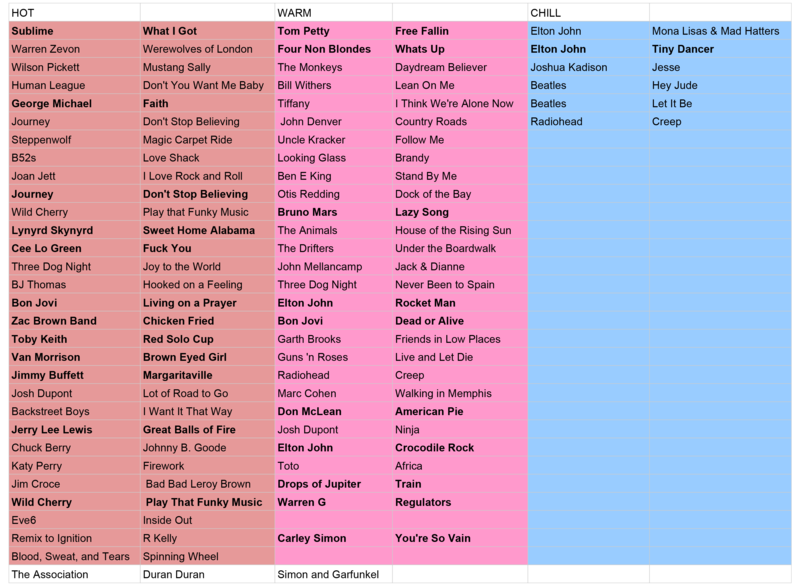 I have the Billboard Hot 100 bookmarked and I listen to most of the songs about every other day on average, usually while getting ready in the morning [edit – just the top few songs, not all 100!!]. The mind is fresh and ready to absorb new tunes in the morning, so why not take advantage! If you don’t subscribe to a music service, most of the current hits are on YouTube for on-demand listening. It also doesn’t hurt to sit down at the piano and play through a verse, chorus, and bridge of the tunes once a week or so. Make it a habit, and soon you’ll be winning over a whole new demographic of music fans.